At The Aesthetic Institute of Chicago, 70-75% of women seek consultations for breast procedures. 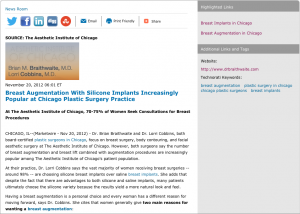 Chicago, IL – Dr. Brian Braithwaite and Dr. Lorri Cobbins, both board-certified plastic surgeons in Chicago, focus on breast surgery, body contouring, and facial aesthetic surgery at The Aesthetic Institute of Chicago. However, both surgeons say the number of breast augmentation and breast lift combined with augmentation procedures are increasingly popular at The Aesthetic Institute of Chicago’s patient population. At their practice, Dr. Lorri Cobbins says the vast majority of women receiving breast surgeries – around 98% – are choosing silicone breast implants over saline breast implants. She adds that despite the fact that there are advantages to both silicone and saline implants, many patients ultimately choose the silicone variety because the results yield a more natural look and feel. -A desire to look better in clothing. -A desire for a more proportionate figure. During their patients’ preoperative consultations, Dr. Braithwaite and Dr. Cobbins spend a good deal of time listening to patients articulate their personal goals. The doctors then present each patient with options regarding the different implant types (silicone vs. saline) and styles (moderate or low profile, moderate plus or mid-range profile, and high profile implants). Additionally, the doctors discuss what each implant type and style has to offer the patient to help develop expectations for the surgical outcome. Following the implant briefing, each patient is measured to determine the appropriate implant range for their size and then given the opportunity to try on sizers in the office prior to surgery. These preoperative consultations work to better ensure that Dr. Braithwaite and Dr. Cobbins work together with the patients of their Chicago plastic surgery practice to produce the ideal results for each individual. Dr. Brian Braithwaite earned his medical degree from the University of Illinois College of Medicine in Chicago and is board-certified by the American Board of Plastic Surgery. He trained in plastic surgery at the University of Louisville and is dedicated to serving the Chicago community with the most advanced treatments and procedures available in plastic surgery. Dr. Lorri Cobbins is a board-certified plastic surgeon and earned her medical degree from Saint Louis University in Saint Louis, Missouri. She is an award-winning researcher and practitioner, receiving the John W. Price award for excellence in undergraduate instruction at the University of Louisville, School of Medicine. Both doctors are available for interview upon request.